Considering pope st. pius x position, Montecassino had an advantage of being an excellent “look out post”, dominating the whole valley below. Were the Germans in the Monastery, looking down from this vantage point on the Allied forces’ every move? No, they were not. At no time whatsoever did the German troops take over or live in the Monastery, and they also respected an area of 300 metres around the Monastery precincts. The German soldiers would only enter the Monastery (ruins) when the monks had left, on 17th February; and three months later, on 18th May 1944, the Allies would take “possession” of the Monastery, the Germans being driven further north. The Allies would enter Rome in June 1944. That the Germans were not, therefore, in the Monastery, is objective truth, as told me by dom Agostino (+1999), – one of the monks who lived through all of this, including the bombing, and survived. (See also the book “Il Bombardamento di Montecassino” war diary of dom Eusebio and dom Martino). Objective credit must also be given to two German officers, – Lt. Colonel Julius Schlegel, (a Catholic), and Captain Maximilian Becker, (a Protestant), both of the Herman Goering Division. On 14th October 1943, these two soldiers, in separate interviews with the Abbot, told him that they could not guarantee that the Monastery would not be destroyed, and for this reason they strongly recommended the Abbot to remove the Monastery library, archives works of art and other treasures to safer surroundings, e.g. Castel Sant’ Angelo or even further north of Rome. They also thought it would be prudent if the monks left too. Dom Gregorio was skeptical. How could he be sure that these treasures would be placed in sure surroundings and not taken to Germany? He asked for time to think so as to be able to discuss this with the community. After a heated discussion with the whole community, it was agreed to move all to Rome, to safer surroundings. The first consignment of books left for Rome on 19th October and over the next few weeks everything else would be packed and sent to Rome. The Germans also gave passage to the Religious sisters who had sought refuge at Montecassino to other convents in Rome. 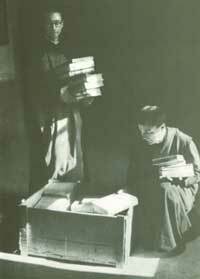 Thanks thus to the initiative of these two German officers, the monastery library of 70,000 books, the archives containing 80,000 documents (eg. the works of St. Gregory the Great, hand written works of St. Thomas Aquinas) works of art and other treasures belonging to the Italian State and the Italian Royal Family, were saved from perdition when the Monastery was destroyed. 11) fra Zaccaria di Raimo, aged 30.”. All the monks would survive the bombing of the monastery, with the exception of dom Eusebio Grossetti, who would die of typhoid on 13th February, two days before. On the 14th February 1944, the Allies (The Fifth Army) dropped leaflets on and around the monastery telling civilians to leave the area. It read: “Italian friends, ATTENTION! Up until now we have tried to avoid bombing the monastery of Montecassino. The Germans have taken advantage of this. But now the fighting has gotten even closer to this Holy area. The time has come where, unfortunately, we have position our arms against the Monastery itself. We are telling you this so that you have the possibility of saving yourselves. Our warning is urgent: Leave the Monastery. Go away immediately. Respect this warning. It is being given to you for your own good. THE FIFTH ARMY. The evening paper informs of us of the following: “This morning at about 9.30 a squadron of 30 bombers repeatedly bombed the Monastery which has been almost completely destroyed. 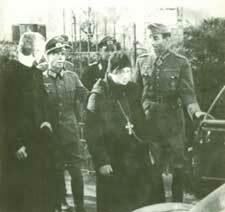 The Germans deny ever being in the Monastery.” We will know the truth if the monks who were there are able to make it to Rome. All in all, from the 15th February 1944 until the 18th May 1944 when it was “liberated” by the Allies, 1,500 planes would drop 2,500 tons of bombs on the Monastery. In a subsequent article, we will “relive” the bombing of the Monastery as written in the diary of dom Martino Matronola, the diary that was abandoned amidst the ruins but was found and returned to him.